Pantone made its first-ever appearance on the West Coast this week for the debut of a limited edition sneaker range developed by SeaVees. The Santa Barbara-based footwear brand previewed the vintage-inspired styles at Fred Segal during LA fashion Week and drew an uber-hip crowd of footwear fans, including Sal Masekala from E! Entertainment. This announcement follows Pantone's recent collaboration with The Gap and a successful pop-up shop in New York City, Other licensed partnerships with the world's leading authority include Japanese retailer Uniqlo, SoftBank Japan, Fine Paints of Europe and numerous household brands. The sneakers were inspired by Pantone's original color guide, created in 1963 and represent the only occasion Pantone has ever authorized the use of its vintage logo and Pantone Matching System moniker. SeaVees cofounders Steven Tiller and Derek Galkin selected seven vintage colors from the only authentic guide known to exist and interpreted them in classic canvas with suede to epitomizie the cool, casual style of California in 1963. The limited edition 09/63 range is at Conveyor at Fred Segal, Seavees.com and other select retail environments worldwide. Available in both men's and women's sizing for the first time. Series production has been restricted to 1,963 pairs. 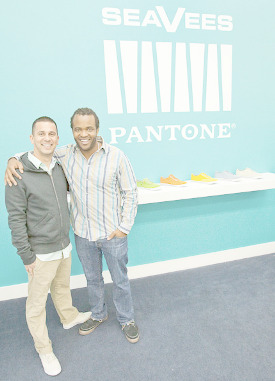 The Pantone and SeaVees license is managed by LA-based brand consultancy, The Skyline Studios. About Pantone: In September 1963, Lawrence Herbert created an innovative system for identifying, matching and communicating color. This led to the innovation of the PANTONE MATCHING SYSTEM, a book of standardized color in fan format. Today, the Pantone name is known worldwide as the standard language for accurate color communication. Pantone is quite simply the color bible. 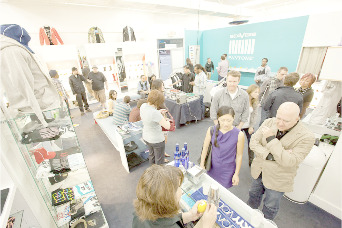 About SeaVees: Purveyors of California Cool, the SeaVees brand is the cofounded by Steven Tiller and Derek Galkin. Based in Santa Barbara, California and distributed thru fine retailers worldwide, the brand is a study in 1960's revisionism. Each sneaker is named after an influencial date in California history.